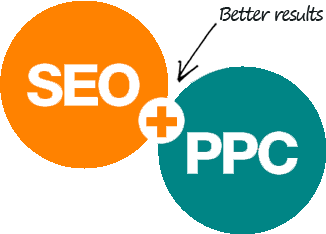 1.PPC informs and optimises SEO: Due to the power of each of these platforms, we see them as the perfect partnership. Take for example, this scenario: a start-up in a highly competitive market has a couple of thousand pounds to spend on online marketing. The start-up is at an immediate disadvantage because their website is new, without the clout (trust and page rank etc) of more established competitors. So competing organically is off the cards, at least for now. PPC therefore is the ideal solution, as it will allow the start-up to bid for relevant keywords. But the optimisation of pages for PPC and the bidding of keywords will focus and mould the start-up’s SEO strategy at the same time, killing two birds with one stone. 2.With PPC you can offset the price of organic search: SEO rankings receive a higher click through rate than PPC listings. So if an organic position were to decline, businesses can still increase their click-through rate and offset the price of organic search. This strategy is particularly useful for websites that receive an automatic or manual Google penalty, or for websites that struggle to maintain their organic positions due to strong competition. It’s also useful if you hold rankings that fluctuate wildly, PPC can balance this out and ensure you still receive very relevant and targeted traffic to your website. SEO Agency » Blog » Should I be focusing on SEO AND PPC?